God is indeed good. I put out my blog and various emails last week about the arrival of my new book, Promises for Dynamic Living. I got an immediate response from a Christian Radio station in New York. The host, Rick Tocquigny, of a program called Life Lessons had interviewed me in the past about Fearless Living and wanted to feature me on today’s program. Doing live radio is unnerving to say the least. There are no do overs or well, let me think about that answer and get back to you! Here is the link to my interview. I pray that God was and is glorified by my words and that I made sense. Boy! That 15 minutes went by in a flash!! Thank you faithful prayer warriors for upholding me in your prayers. I surely felt them when I was in the midst of the interview. 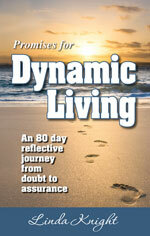 Promises for Dynamic Living has arrived! !